I’m done with writing about September 11th. Someone sent me an email asking why I hadn’t written anything marking the 15th anniversary of September 11th. The truth is I’m done with it and have been for awhile. I last wrote an entry about it back in 2008 and I’ve not written another one since. I figured seven years of talking about it every year was enough. My opinions haven’t changed much in the eight years since. In fact I find the annual ritual to be nothing more than an exercise in false patriotism largely engaged in by folks who think they have to out-American everyone else as though it were a contest. “Look at me! I’m a great American ’cause I haven’t forgotten!” The same sort of folks who put those stupid magnetic ribbons on their SUVs that say “I SUPPORT THE TROOPS” and think they’ve actually done something supportive. The only exceptions are the folks who were directly impacted by the events that day. I do not begrudge them their time to reflect and remember every September, but the vast majority of people in this country that wave their flags and scream about “not forgetting” are not those people. As Jim Wright wrote on his blog, we’ve had our revenge and then some. Not only did we smash the Taliban in Afghanistan, but we decided we might as well stomp all over Iraq while we were at it even though they didn’t have anything to do with 9/11. We inflicted a death toll far exceeding what happened to us on that fateful morning. Depending on who is doing the counting, the estimates are that between 151,000 to 1 million Iraqis have died as a direct result of our invasion of their country. Again, a country that had nothing to do with 9/11. Assuming it’s the conservative estimate of 151,000 then that’s a 4933% difference and that’s not even counting the 91,000 people killed in Afghanistan as a direct result of our war on that country. As a reminder: 15 of the 19 hijackers were from Saudi Arabia and the rest were from the United Arab Emirates, Egypt and Lebanon. All countries we did nothing to. In the course of exacting our revenge we sacrificed an additional 8,000 people to the cause — 166% more than died in New York on 9/11. We also sacrificed major chunks of our civil liberties, privacy, and moral high ground in the course of making ourselves “safer” without actually making ourselves any safer. But hey, at least we don’t have to worry about Iraqis or Afghans attacking us again, right? Apparently it’s not enough that we’ve spilled an excessive amount of blood in retaliation for 9/11 while also laying the seeds for further terrorism against us. It seems we’re required to pick at the scab every year until it bleeds anew so we can feel justified in our ongoing hatred of others. No thanks, I’ve got better things to do. I was not directly impacted by the events of 9/11. 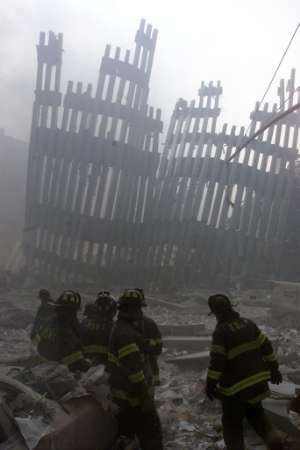 I didn’t lose any loved ones or close friends when the towers fell. All of my connections to the event in question are indirect and consist mainly of being an American who was alive when it happened and witnessed it unfold on TV in real time. I don’t need to be reminded of it because I will never forget it. The same way I haven’t forgotten where I was when President Reagan was shot by John Hinckley Jr. or when the space shuttle Challenger exploded or any of the other major events that have happened in my lifetime. I have sympathy for and empathy with all of those folks who have direct experience with those events, but eventually we have to move on. I have had loved ones I care deeply about that have passed away that I didn’t grieve for as long as we’ve grieved over 9/11. It’s not healthy and I refuse to let it drive me to hatred and anger. I debated whether to even bother writing this much as it feels like I’m letting myself get dragged into it yet again. I’m pretty sure this will be the last thing I write on it. In the future I’ll just point folks to this entry when they ask why I haven’t engaged in the yearly self-flagellation ritual that is 9/11. I’ve never seen faith move mountains, but I’ve seen what it can do to skyscrapers.